Butterick 6007 Misses dress & Belt - Dress A: close-fitting bodice, front button band, seamed waist with applied casing/drawstring, side front pockets & short sleeves and fold back cuffs. Dress B: front button band, collar, collarband & self belt. After coming across an Article on How to Wear a Shirt Dress, it was high time that I added one to my wardrobe. Let me tell you... this dress should be a summer staple if one is looking for structure with a lil preppy. How can one go wrong with a comfortable and flattering garment. Especially being that it can be worn long, loose or belted, as well as under a jacket or cardigan. 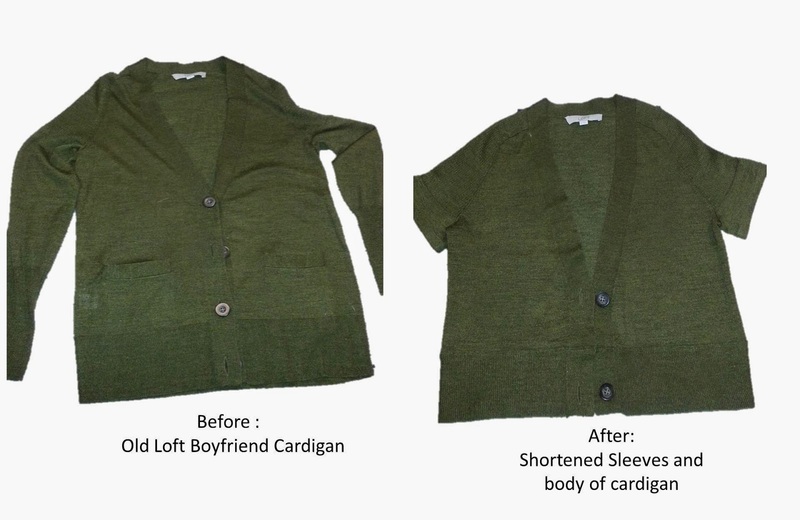 The cardigan was a mini-refashion using some of The Renegade Seamstress techniques. Fabric: Printed Stretch Cotton from Virgo Fabrics. Pattern Sizing: 8 - 16, I cut a 14. Did it look like the envelope photo: Yes, I also made the self belt, but opted for a rtw belt. Were the instructions easy to follow: The instructions were clear. However, for the collar and collarband application I used Palmer/Pletsch technique. What I liked particularly about the pattern: Wanted to add a different style of dress to my wardrobe and this shirt dress fit the bill. Pattern alterations or design changes: I added front and back waist darts and omitted the sleeves. Also ended up removing 5/8" from the side seams starting at the waist down to hem line for a slimmer fit. Would you sew it again? Would you recommend it to others? I will definitely sew another and totally recommend this dress. Conclusion: I can see this shirt dress adding a tremendous value to my wardrobe. I love your dress and how you styled it with the refashioned cardigan. You look fabulous and I am heading to check out that article, I might need to sew one of these! Looks great and I love how you styled it. I've always liked shirt dresses. My sister, who still sews for herself found a 1960's pattern at a thrift store, made the shirt dress from a navy linen. It turned out gorgeous. We called it her I Love Lucy dress. Hi Syl. I could I forget Lucy and her gingham shirt dresses. This dress is soooooo pretty. So perfect for summer, it looks so cool to wear. Love it. Great dress! Love your tropical fabric. Love this dress and the refashioned cardigan! Thank you Carolyn. You and Debbie hooked me on to cardigans over the years, which I love. However, purchased a few cardigans that were too long for my short torso. In come refashion mode. This is so cute Sheila, I love how you styled this outfit.. I love, love, love this dress. This is the one with buttons galore? !...too cute. Sew versatile. Love, love, love it with the refashioned cardi! Great staple dress for sure! Nice work! Thank you Terri, yes it's that dress. I was totally dreading the 9 buttonholes, but with encouragement I got it done. Love that dress, especially with the cardigan.